Willow Garage just built 25 telepresence bots. Let the open source festivities begin! Fans of open source robotics need look no further than Willow Garage. Not satisfied with merely creating an amazing robot platform that plugs itself in to recharge (PR2), they are also one of the driving forces behind an open source Robot Operating System (ROS). Now, Willow Garage has unveiled another ambitious project: telepresence robots. They recently finished building 25 of their Texas Alphas (TAs) – robots that allow workers to telecommute and command a dynamic representative thousands of miles away. The TAs are going to help with human-robot interaction research at Willow Garage and some are being lent out to other companies to test their feasibility in a non-robotics workplace. Looks like Willow Garage just jumped head long into the telepresence business and that could mean amazing open source development for the field. Check out videos of the TA in action below. Willow Garage knows that the Texas bot works because they’ve been using it for months. Dallas Goecker, a WG employee in Indiana uses the original Texas to telecommute to work in Silicon Valley. Goecker hacked the original TA together using spare parts from WG’s PR2 research bots. Can we pause for a moment and think about how cool that is? Some WG employee got tired of not having a presence at the main office, so he built a frakkin’ robot from spare parts! That’s the sort of attitude that makes Willow Garage such an impressive robotics company. Dallas Goecker explains the Texas…while telecommuting through the Texas! Awesome. Of course prototypes can be impressive, but it takes more than one successful hack to make a new line of robots. Luckily Willow Garage is not a company that rests on its laurels. The original Texas required someone on the robot side to plug the machine in every night. So WG had developers use Open CV to teach the bot how to dock itself. Now, a teleoperator can drive a TA to its dock, and the robot will charge itself for the next day. In the morning, the teleoperator can drive the TA out of the station, no (local) human assistance is required. It’s not quite as awe-inspiring as watching the PR2 plug itself in autonomously, but it’s still pretty badass. Oh, and in case you wonder what robotics engineers do for fun, here’s a video explaining how two developers taught the TA how to balance on two wheels like a Segway. All in a day’s work. Literally – it took these guys just one day to do this. The more I hear about the Texas Alpha, the more impressed I am with the versatility and speed of Willow Garage’s open source approach to robotics. Hardware and software that was developed for PR2 ported over easily to the new concept bot and helped develop it into a fleet of telepresence machines. That alone is a great example of why open source technology is the key to building the robots of the future. Now, to be fair, there are some things to skeptical about. The TA runs Skype, which is a great program, but only when it works. 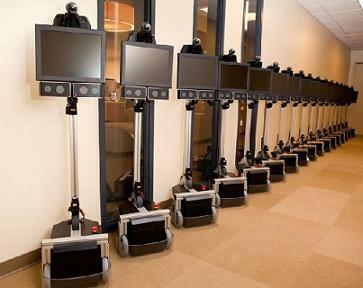 More importantly, 25 telepresence robots, while impressive, is simply a test sample. We’re not talking about mass production like Anybots is starting, and we’re nowhere near the level of capital invested in video conferencing. Willow Garage may be poised to make a splash in the industry, but they haven’t dove in yet. But that’s about all the skepticism I can muster for these robots. They’re just too cool. The Texas Alphas are built to be as adaptable as possible so that anyone with an allen wrench can customize them. The same goes for the open source software. These bots aren’t merely test subjects, they’re working machines. WG engineers have even controlled a TA from Japan using a web browser on their cell phone! With the TA as an open source research platform for telepresence robots, it seems very likely that the field will continue to develop rapidly in the next few years. We may not reach Avatar or Surrogates situations in the near future, but the Texas Alpha makes me think we’re headed down that path.